This is the next posting in the Thinking Styles series: See Think about it – 8 ways to enhance your thinking for an introduction to the series. If you have a scientific background (and probably even if you don’t) you are likely to pride yourself on being able to think systematically. But, can you think systemically? Systematic thinking with its logical, sequential and linear approach is very important and contributes to most of the thinking styles covered in this series. Systemic or Systems Thinking is much less prevalent but potentially even more important. The approach looks at systems [dynamic entities with interactive elements that act as purposeful units] and their relationship to their environment [everything outside the system]. The concepts build on the ideas of Russell Ackoff, Peter Checkland and latterly, Peter Senge amongst many others. Systems thinking starts with some relatively straightforward concepts and can provide insights into the most complex of natural and man-made entities. to see how the system interacts with its environment. 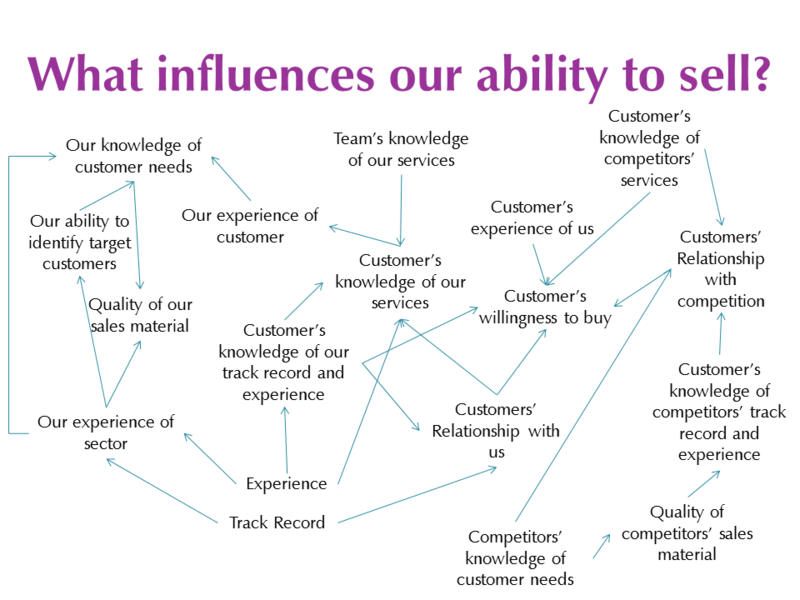 Influence diagrams are fairly easy to produce and very useful for facilitating discussion. Producing the diagram encourages effective dialogue and this can be as, if not more valuable, than the diagram itself. Influence diagrams highlight the interconnections between the various issues. By adding information on the direction of influence these can be developed into multiple cause diagrams which can help you to identify reinforcing and self-sustaining loops. Reinforcing loops, also known as virtuous or vicious circles (depending on whether they are positive) are often buried in the depths of real life issues. Self-sustaining loops tend to bring systems back to equilibrium and can sometimes explain why it appears to be impossible to effect change. Peter Senge suggested a set of frequently recurring structures resulting from various combinations of Reinforcing and Balancing structures. These are often called archtypes: no doubt you will recognise these elements in some of the situations you come across. The very simplified graphic below shows how two reinforcing loops [empowering and depowering circles] limit individual performance with a self-sustaining element of the notion of self-worth. This is an example of the “limits to success” archtype. To shift the balance between the two circles, the individual needs to develop a different perception of their own self-worth. The situation is naturally much more complicated than this as the causal loops (circles) are much more complex and the notion of “Self-worth” is itself part of a complex set of interactions. Nevertheless, this simplification can be of great help in coaching situations and can shift the focus from performance to beliefs, which can then be worked on.